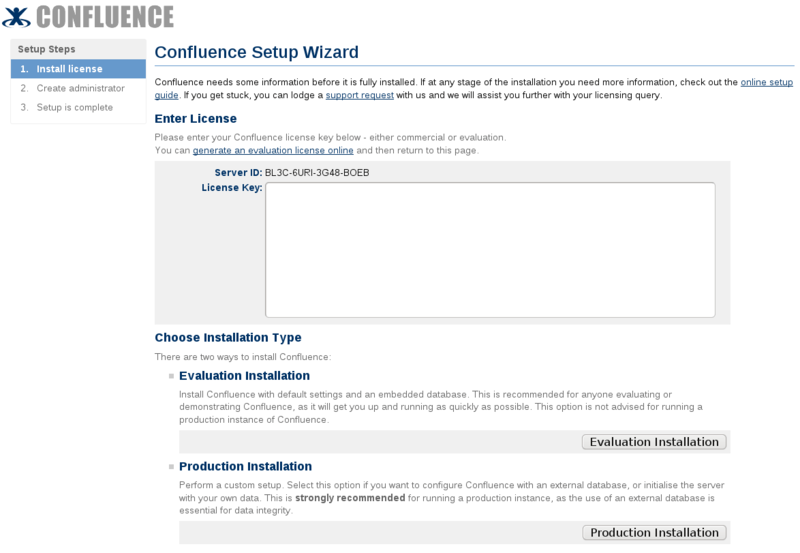 Quite often lately we have been asked to set up a Java based wiki, or customers have asked specifically for Confluence® (made by Atlassian® ) by name. Confluence is a powerful and sometimes complex piece of software, so to make the setup for that easier I created an install script. In a very short time it is now easy to get up and running with minimal fuss. The script is available in our repository for general use now. It can also be directly downloaded. I've tested it on all the install options we offer so that should work, but if you see any bugs please do let us know. By default (ie just running the script with no paramaters) the install script will insure a recent version of Java and MySQL are both setup ready for use with the software. That will also come complete with an init script that can be used to manage the service, and have the application set to start on boot! You will need to complete the web based setup wizard there. Go to the URL shown. You should see something similar as shown in Step 2 on the confluence documentation. You will need to grab an appropriate license key from Atlassian using the link on your setup page. Add that in. For most users you will also want to have a MySQL database running the back-end, so then select the "Production Site" option. And when you get to the database selection screen choose MySQL and click "External Database". You can then use the information given at the end of your install run to complete the "Standard Database Connection" option. Follow your nose from there, or you can refer to the excellent documentation linked above. Which has a complete rundown on Confluence options and setup. Confluence has a lot of options, so its easy to spend a lot of time tweaking things to get it just right, although that is generally well worth it. You may prefer to have your confluence site running on a normal URL, without the port number showing. Thats easy enough to do using mod_proxy and Apache, or you can pop in a ticket for us to set that up for you. Meanwhile, time to get started adding some content! This entry was posted in Rimuhosting and tagged Atlassian, confluence, install, java, linux, script. Bookmark the permalink. I did try your script on Debian Squeeze and it fail at the end while trying to init confluence. I don't have any log of the failure. I can give you root access if you would like to take a look by yourself. BTW, thanks for this time saver. Thanks for trying it out Simon, glad it worked (mostly) for you. I tried to replicate the issue on squeeze but that seemed to work fine for me. If you already have java services installed there may have been a conflict with the port used for that. Any other details, you can pop in an email to support at rimuhosting dot com. Add (attn Glenn) in the subject and I'll try to address that. I did install Java from aptitude the first time - that was causing the failure. I did a OS reload and tried your time saver script on a fresh install of Debian Squeeze and it's working great. FWIW I fixed up the init script used here so that we dont set JAVA_HOME as forcefully. That way distro or custom settings should still work. Thanks for the code, it helps to see it all typed out. I did try your script on Ubuntu 11.04 and it fail at the end while trying to init confluence.
! Error from command: unrecognised paramter 'sudosu'.